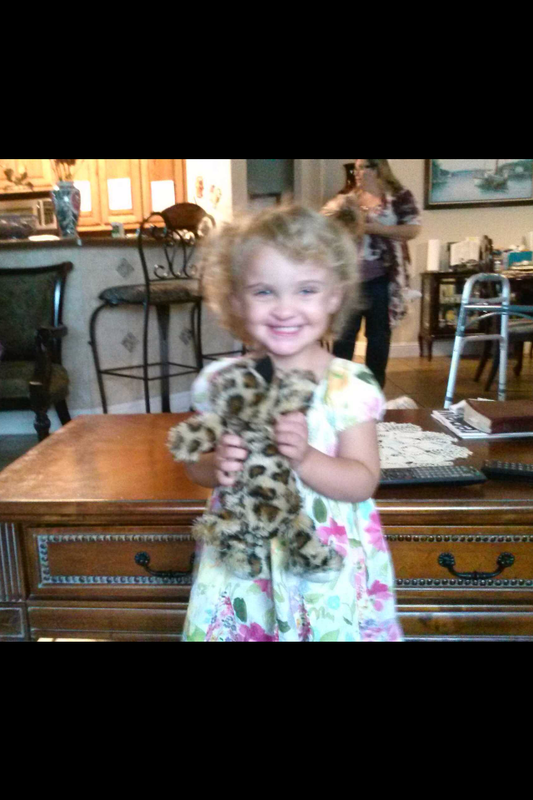 She made up for not being in the hospital delivery room, by being in the hospital for each of Kymee’s operations. 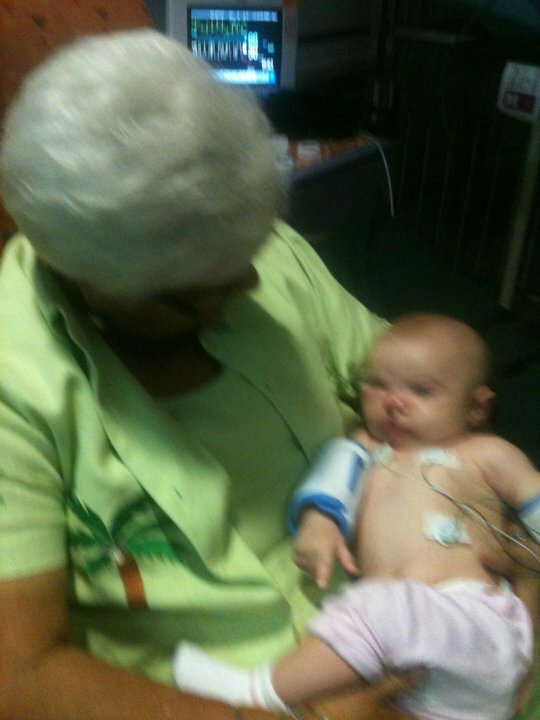 She maneuvered around Kymee’s breathing tubes and IV as she sang “La linda monita” to her. 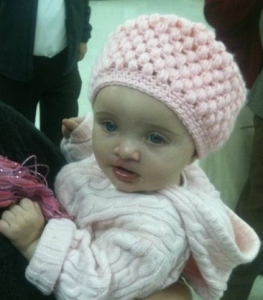 Abuela crocheted her a blanket, and a hat, and bought her little dresses at garage sales. And when Kymee grew out of medically designed bottles, and no longer had to eat through a syringe – Abuela made her hot cereal, arroz con leche, and tembleque. Kymee’s first solid food was a bowl of Abuela’s beans and rice, which to this day is her favorite meal. Before she could speak, we would pull our van up in front of Abuelo and Abuela’s house and Kymee would smile, squeal and clap. Abuela was completely dejected when Kymee learned to say Abuelo before Abuela, and would pout if Kymee choose to give Papi a hug before she got one. But no matter how sick she became, Abuela would light-up the minute Kymee entered the house. Kymee loved trying on Abuela’s hats and shoes, and playing with Abuela’s baby doll and Abuela would share her teddy bears that she’d received from loved ones as she was in the hospital. Kymee and Abuela shared a love for gardening. In the spring, when Abuela felt up to it, Kymee would help her water her flowers in the backyard. Kymee would walk around the garden and talk to all of Abuela’s ceramic turtles and frogs which were hidden under the bushes. Abuela would smile, laugh and hug her. 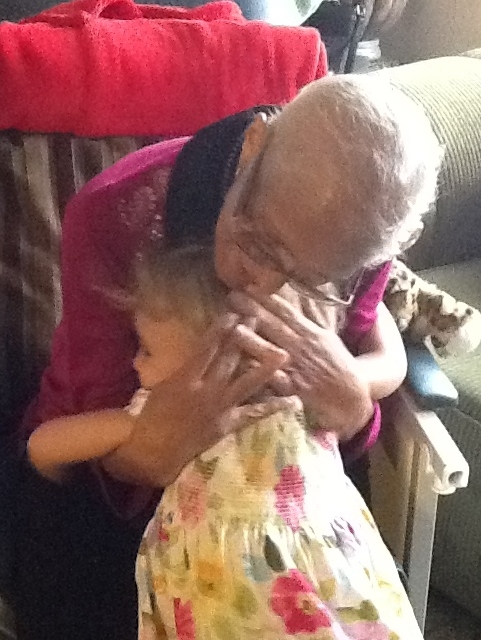 When Abuela was too sick to play, Kymee would sit and cuddle with her, and run around her, and hug and kiss her. Kymee got scared when she saw Abuela in bed, too sick to play. Abuela told us to take her away and not scare her. Kymee left the room, a few minutes later, she crept back in and laid her favorite stuffed animal on Abuela’s chest, then ran out of the room. The precious gift was received and treasured all day as it remained on her chest. Kymee may never remember these precious times with her Abuela, but God blessed Abuela through Kymee and gave her joy immeasurable in her final time here on earth. What a precious, tender story. 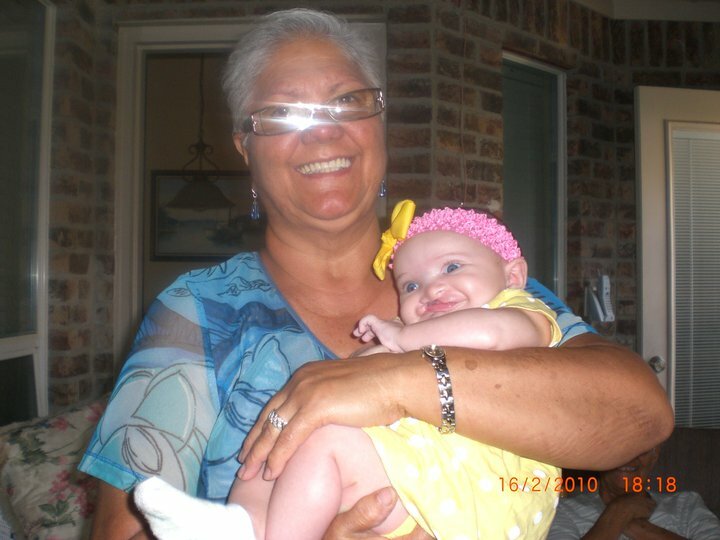 Both Abuela and Kymee were blessed with their love for each other. I trust Kymee will remember a bit of it. Be sure to save this for her future memories. Kymee's mama was a special blessing to Abuela too–again, God-given love between two precious ladies which will continue to live in Joyce's heart. God bless you in your loss, Honey.